A boutique collection of only sixteen waterfront Richmond residences at Nakade Steveston community are now completely sold out. However, if you are looking for a waterfront Nakade Steveston condo to purchase, please check with your local realtor for resale listings at this beautiful community. Steveston real estate’s premier neighbourhood presents the ultra high-end waterfront Richmond Nakade Condos that offer stunning interiors that are sophisticated and modern, geoexchange built green features and spacious living spaces. According to their marketing, the arrival of the new Steveston waterfront real estate development at Nakade Richmond condos has created a new echelon of elegant, classic living in this idyllic village. At first glance, the striking façade of Nakade Steveston condos for sale is reminiscent of the rural estate homes upon which Steveston Richmond was founded. Overlooking the Fraser River, Nakade Steveston waterfront condos for sale is remarkable for its full riverfront exposure coupled with an innovative, contemporary structure for today’s home buyers. The 16 expansive, single level and loft waterfront Richmond homes for sale at Nakade Steveston real estate development are carefully positioned in three separate buildings, all of which are characterized by their stately craftsman style architecture. The Steveston waterfront condo buildings are connected by a stunning glass structure that permits a sense of the original configuration while joining the new Richmond homes with a common elevator, lobby and amenity space for all residents to enjoy year round. The elegant, crisp and classic West Coast architectural design of the waterfront Nakade Steveston condos for sale maximizes the spectacular Fraser River, North Shore Mountains and community views. Within the interiors of these luxury Richmond condos, Nakade homes brim with features as yet unheard of in most other new condominiums in the area, with an assortment of amenities that merge to create the ultimate stylish and urban lifestyle for today’s homebuyers. The natural stone, broad columns and deep porches define the master planned residences, which rise proudly from among brilliant professional landscaped grounds. A gentle trail winds beneath the bridge, and perennial planting provides year round colour and texture to your community. In addition, the signature waterfront Nakade Steveston condos for sale features a beautifully detailed gazebo with a hot tub and sauna that provides a perfect sanctuary for residents. Also, there is a luxurious entertainment room with 120” screen, surround sound, indoor/outdoor fireplace and a great clubhouse for entertaining parties. This is a neighbourhood where finely crafted waterfront Richmond homes are steps from the Fraser River and conveniently close to local services and amenities. Yet, even in a community definted by style, the waterfront Steveston Nakade condos fro sale stands out as Richmond real estate’s premier address, unrivalled by any other development. The perfect surroundings for the ideal lifestyle are here at Nakade. If you are looking for a beautifully designed, environmentally friendly new Richmond condo development, the Nakade waterfront Steveston condos are the perfect home for you. Until now, chances are you have paid little attention to the systems that heat and cool your home. Introducing the GeoExchange System for heating and cooling here at Nakade! In simple terms, this advanced environmentally friendly climate control system here at the waterfront Steveston Nakade condos for sale involves extracting heat from the ground and transferring it to your new Richmond home when you need warmth. In hot weather, the new GeoExchange System does exactly the opposite, removing heat from your home and returning it to the earth, thus reducing the interior temperature of your residence. In more complex terms, the new Richmond green community at Steveston Nakade condos presents the GeoExchange System which is a closed loop system that utilizes ground loops, a heat pump, a duct system and a fan coil unit to accomplish year round air conditioning and heating. The GeoExchange System provides up to eighty per cent of the heat required for your hot water tank and all the heat you need ot make your home comfortable via forced air ducts. What’s great about the new GeoExchange System at the Nakade Steveston waterfront condos is that they are far more efficient than traditional electric or gas heating. Therefore, the GeoExchange System reduces Nakade homeowners’ cost of heating and cooling over time. Plus, GeoExchange does not produce any greenhouse gases, making it a completely green feature for your home. The Nakade GeoExchange system also presents a number of other homeowner benefits that include a compact system that is unobtrusive and a long longetivty life. The same Nakade Steveston waterfront condo GeoExchange system has been installed in such buildings as the Shangri-La, BCIT Aerospace Technology Cener as well as the Olympic Richmond Oval. GeoExchange is perfectly suited for the Richmond real estate market, where the high water table provides cool temperatures and the ground consistency makes it relatively easy to bore the 12 holes required three hundred feet into the ground. And once installed into the Nakade Steveston waterfront condo building, the loop in a GeoExchange system is concealed beneath the ground, silently tapping thenatural heating and cooling provided by nature. In a nutshell, the GeoExchange heating and cooling system used throughout the Nakade Steveston waterfront condo building design services to minimize energy consumption, reduce associated costs and provide an environmentally friendly alternative to traditional heating and cooling systems while ensuring year round comfort. The closed loop GeoExchange System at Richmond Nakade condos for sale utilizes ground loops to harness energy in the heat pump, circulating it throughout the home while providing up to 80% of the heat required to heat your water tank. The Richmond Nakade GeoExchange system reduces the cost of heating and cooling your home, and reduces greenhouse gases in addition to providing you with virtually no carbon dioxide emissions. The inspired interiors at the luxury Steveston condominiums include entrance foyers, four inch granite baseboards, built in key and mail cabinetry, show drawer and extra wide forty two inch halls with oversized doors. In addition, there are motion sensing light switches throughout and crown mouldings for the elegant interiors. The Steveston Nakade luxury condominiums also feature an insuite laundry closet with front laoding Bosch washer and dryer. The spacious bedrooms present three way switches, motion activated floor level lighint, burglar resistant film laminated window glass, solid core doors and an intercom and emergency call swith. The master ensuite bathroom at the luxury Steveston condominiums of Nakade Richmond real estate project by Oris Development also features Kohler fixtures, rain shower head, shower seat, radiant floor heating, motion activated under cabinet floor lighting, trimmed mirrors, heated tower racks, built in vacuum dustpan, ultra quiet fans and free standing furniture style vanities, granite counters and double under mount sinks. The spacious foor plans also feature entertainment rooms at the luxury Richmond Nakade Steveston waterfront condos that include recessed niches for your TV, JBL surround sound in wall speaker system, Telus pre-wiring, soundproofing and internet wireless router and switch. The spa style bathrooms (second and powder rooms) are also very well finished. The gourmet chef inspired kitchens at the luxury Nakade Steveston condominiums have Euro style ultra premium Electrolux ICON appliance package, built in wine fridge, premium cabinetry, ceramic/glass backsplash, solid granite countertops, under mount double bowl sink with Kohler pull-out spray, under cabinetry LCD foldaway TV, under cabinetry task lighting, lazy susan pot drawer, wide drawers, pantry spaces, no-slam dampened drawers and self closing doors as well as metal drawer sides for extra durability. The living and dining room at the luxury Nakade Steveston Richmond condominiums for sale introduce low voltage recessed lighting, gas fireplaces with built in fans and wireless remote control. They are large rooms with great views, oversized doors to large decks and patios. Throughout the new Richmond condominiums are solid core doors, great views, low-E glass, two Jane McCutcheon interiors in three colour scheme options, geothermal domestic hot water, GeoExchange System and air conditioning. Nakade Steveston waterfront condos are brought to the Richmond real estate market by Oris Development, a company with a strong history of award winning communities. London Landing, one of Oris Developments’ most recent successes has won numerous awards for Best Townhouse Development. The presentation centre for the Nakade Steveston condos for sale is only open by appointment now, as the community is sold out. 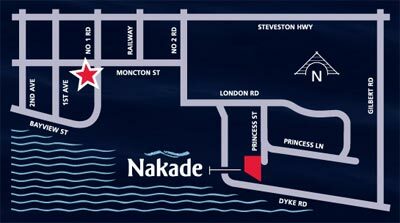 The Nakade at London Landing Steveston condos are presented at Suite 100 – 12235 No. 1 Road, Richmond, BC and you can find out more by visiting the Richmond London Landing web site today at www.londonlanding.com. All homes are backed by the Travelers Guarantee Company of Canada and there is new generation rainscreen glazing system. There is secure underground parking, ultra quiet garage door openers, two bike storage lockers, pet wash area and parkade lobby. The amenity room at the luxury Steveston Nakade condos for sale will feature a great clubhouse with entertainment sized screen, lounge areas, inner courtyard and spacious outdoor deck. The exterior finishes of the waterfront Steveston condo building includes solid granite cobblestone patterned cladding anchors, strong colours on durable hardi-plank cement board siding, hardi-paneling, high profile fibreglass reinforced laminate shingles and elegant wood trimming. 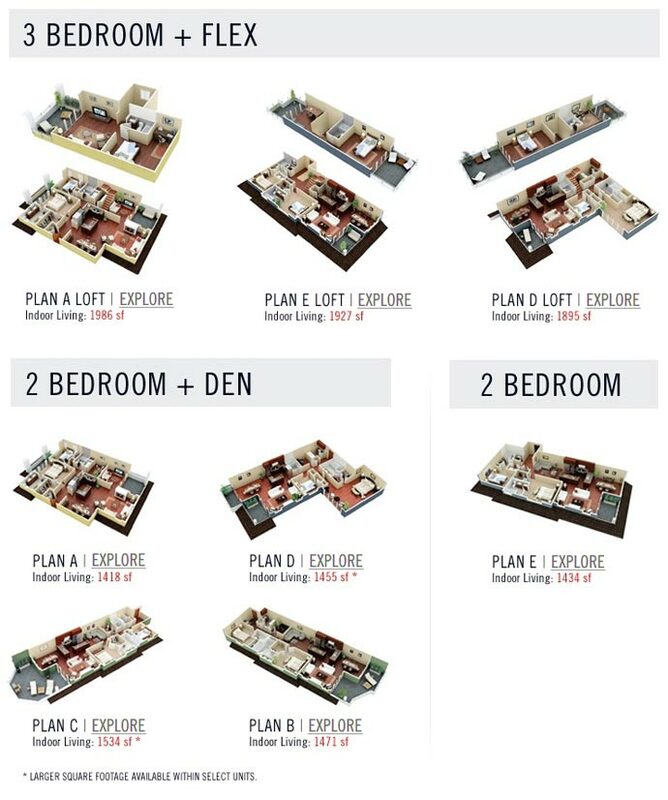 The floorplans at Nakade Steveston features a combination and wide variety of layouts that include three bedroom and flex floor plans (with lofts) between 1895 sf to 1986 sf in size. In addition, there are one level two bed plus den Nakade Steveston waterfront condos that are between 1418 to 1534 square feet. Lastly, the smaller two bedroom suite is 1434 sqft.